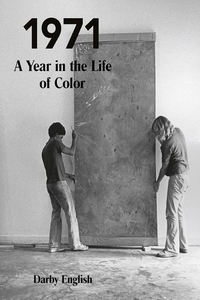 1971: A Year in the Life of Color looks at many black artists' desire to gain freedom from overt racial representation, as well as their efforts--and those of their advocates--to further that aim through public exhibition. Amid calls to define a "black aesthetic," these experiments with modernist art prioritized cultural interaction and instability. Contemporary Black Artists in America highlighted abstraction as a stance against normative approaches, while The DeLuxe Show positioned abstraction in a center of urban blight. The importance of these experiments, English argues, came partly from color's special status as a cultural symbol and partly from investigations of color already under way in late modern art and criticism. With their supporters, black modernists--among them Peter Bradley, Frederick Eversley, Alvin Loving, Raymond Saunders, and Alma Thomas--rose above the demand to represent or be represented, compromising nothing in their appeals for interracial collaboration and, above all, responding with optimism rather than cynicism to the surrounding culture's preoccupation with color.